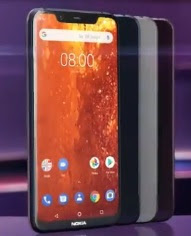 Nokia has launched Nokia 8.1 smartphone in Dubai as per scheduled on December 5, 2018. The phone comes with the top notch design, powerful battery and PureDisplay screen etc. The brand has earlier released smartphones like Nokia 7.1, Nokia 3.1 and Nokia 6.1 Plus etc. and the company has launched the above subject phone with ample features. If you are looking for Nokia 8.1 key features, specifications, price, first impression, review, unboxing, comparison and hands-on etc. then you could find some of them over here. The phone is powered by Qualcomm's Snapdragon 710 SoC processor and paired with 3GB / 4GB RAM variants. The internal storage of the gadget is 32GB / 64GB with memory expandable option up to 128GB via microSD card. Nokia 8.1 smartphone runs with the latest Android Pie operating system and two day battery life. The mobile phone from Nokia comes with PureDisplay screen and improved ZEISS optics. With regards to the cameras of the cell phone, it comes with 20 megapixel Selfie camera and 12+13MP dual rear cams. The display size of the phone is 6.18 inches larger screen. The phone is the successor to the Nokia 7 Plus. You can find Nokia 8 price and tips, below. Tips: It seems the phone has incredible features in a competitive price. So, no issue if one grabs and enjoys it.